If you’re at loss for what creative write-ups you can write for your daughter, don’t worry, you’re not the only one! 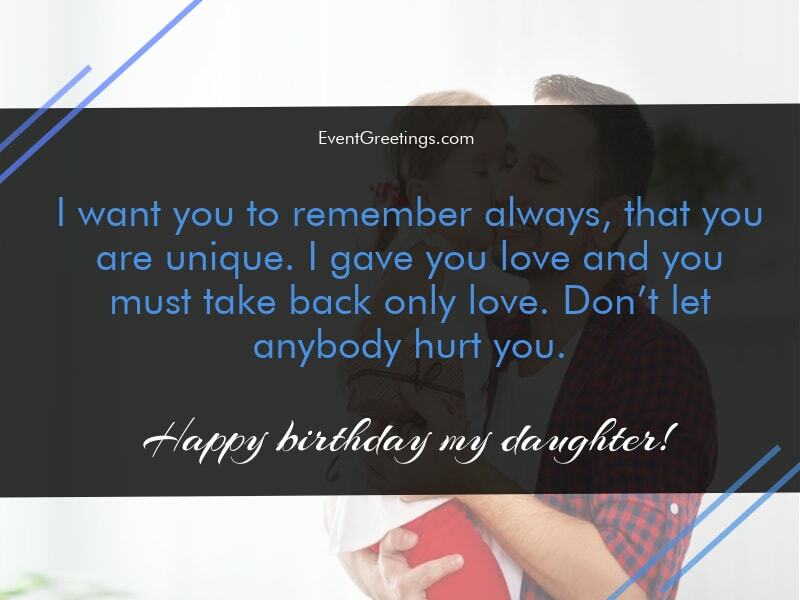 We have compiled a list of beautiful and loving birthday wishes from a dad to a daughter that you can use to rise to the occasion. Whether you’re looking for a simple and elegant quote or a lengthy paragraph containing all the wishes that you’re bestowing to her, you will definitely find something to your liking in this list. Just look for a message that applies most strongly to your relationship with your daughter, and present it to her on her special day! 1. My daughter, If only I could force you all the happiness of the world, I would have already done it. Happy birthday! 2. You are the princess and the fairytale of my life. Happy birthday my daughter! 3. My wish is every wish was given to you today, become true. Happy birthday sweetheart! 4. Every night, before I fall asleep, I wish to wake up safe and sound, just to watch you sleeping and dreaming happy. Happy birthday! 5. Every year this day, the same scenery. I can’t stop thinking of that really first moment I met you. You gave meaning to our lives. Happy birthday my daughter! 6. I want you to remember always, that you are unique. I gave you love and you must take back only love. Don’t let anybody hurt you. Happy birthday daughter! 7. Today is the birthday of the most amazing, smart, beautiful girl in the world. My daughter! Happy birthday sweetheart! 8. Years passing by, and I am so proud of what you have become my daughter. Happy birthday! 9. Today you are allowed to go out for drinks, have fun, and eat the whole cake, with one condition. Stay as amazing as you are. Happy birthday my daughter! 10. When you were born, you took all the darkness away. Happy birthday my daughter! 11. One day you may be a woman, but I will always remember your first laughs and cries as a baby. Happy birthday sweetheart! 12. My dear daughter, I am always thinking of you, when I take walks to the park, when I hear your favorite song in the radio, when TV plays your favorite movie, when your bedroom at night is as messy as you left it in the morning. You are my little trouble. Happy birthday! 13. I will give you my wings my angel, wide as they are, to keep you safe always. Happy birthday! 14. They say that men don’t cry. I say that I cried when I saw your face for first time, when I learned you walking, when I heard you calling me “Dad”. I love you honey, happy birthday! 15. I wish you to be as happy as I am when I am with you. Happy birthday daughter! 16. Who is sweetest? My girl or her candy? My girl, of course! Happy birthday daughter! 17. All the darkness went out the day you were born. Happy birthday my daughter! 18. Every year you become more and more necessary to me. You are the sun in my soul. Happy birthday sunshine! 19. When you were born.. I remember that special day in the hospital. I was as proud as a lion is. As crazy as lovers are. That day I became a man. Happy birthday my daughter! 20. You are not the only one celebrating today. It’s me too. Happy birthday sweetheart! 21. I was there. When you first cried, on your first worry, on your first shout, on your first love, because you are my first tear, my first care, my first voice, my daughter! Happy birthday! 22. If we talk about priorities, you are one of them. Actually, the first one in my life. Happy birthday treasure! 23. Since I was a young man I wanted to be rich. My wish came true. I am your father. Happy birthday my daughter! 24. I know that many times I hurt you, but it’s because I love you and I care about you. I ‘ll always. Happy birthday! 25. Try to match all the pieces of the puzzle called love of the father to daughter. Even then, you won’t imagine how much I love you! Happy birthday my one and only. The father-daughter relationship can be fun and adventurous – it can also be complex with an entire roller-coaster of emotions included. A daughter and mother can easily show affection for each other naturally, but the same can’t be said for father-daughter relationships. At a certain age, daughters and fathers just don’t bond as well anymore. Even if a father wants to show his love for his daughter, the right words can be hard to find. These words apply for various scenarios, but one that stands out the most of all is a father’s birthday wishes for his daughter. 26. The first time I held you in my arms was the best day of my life, and now you’re all grown up and becoming a woman. I wish the best on this lovely day. Happy birthday! 27. You’ve always been such a lovely daughter. So kind, so caring, so full of life and laughter. All the best on your special day. Happy birthday! 28. It’s not easy being a father. It takes hard work and time, but you made the job a lot easier. You were always doing your homework, finishing your chores, but most importantly, showing me love. I’m so thankful. Happy birthday! 29. I never believe in miracles until I laid eyes on you. The second you came into this earth, I knew you would bring us so much happiness. I was definitely correct. Happy birthday! 30. I will always be so grateful that you are in my life. I couldn’t ask for anyone to be a better daughter. You’re funny, sweet, and kind, and always know how to put a smile on my face. Love you! Happy birthday! 31. You’re still my little princess. My princess who is grown up and away from her castle. That’s okay, because you’ll always have a special place in my heart. You’ll always be my little girl who brings joy into my life. 32. I’ve watched you grow from a little girl to a powerful woman. You’ve had such a lovely journey and you’ll have many more years of love and laughter. I’m sure of it. Happy birthday! 33. Dear daughter, you are such a gift. You’re so kind and elegant and have always shown me love. I’m forever thankful for your lovely ways. Happy birthday! 34. You’re the smartest, kindest, most beautiful girl in the world. I’m proud to call you my daughter. Happy birthday! 35. You might be grown up, but you’re still our little girl. Still our baby. We miss the old times when you were young, but we’re so happy to see what you’ve accomplished. Happy birthday! 36. You’ve given me more than love over the years. You taught me so much and showed me the importance that comes with having a daughter. Happy birthday! 37. You might be grown up, but I’ll always be protective over you. You’re still my baby and I’ll always be here for you. Happy birthday! 38. You’re still my little angel, my little flower. Dear daughter, you bring me such happiness and joy, and I can’t wait to spend another birthday with you. Happy birthday! 39. I hope you have a lovely day today. You work so hard and have done so much, you deserve to rest and be cheery. Happy birthday! 40. I hope every birthday brings you happiness and laughter. I hope every birthday shows you kindness, because you deserve. You deserve the best. Happy birthday! 41. Every wish you ever made… I hope it comes true. Every hope, every want, every need. I hope you get everything you’ve ever asked for on this day. Happy birthday! 42. From the second I held you in my arms and looked into your eyes, I knew you’d be my special little girl. I knew you’d bring me love and hope and joy, and I was right. You’ve been an angel. Happy birthday! 43. I hope you know how much strength and hope you bring to our family. You’re so smart and kind and we always look to you for answers and guidance. You’re always going to be our smart little girl, and we couldn’t be prouder. Happy birthday! 44. When I’m feeling down, I just think of you and I smile. How can I be sad when I have such a kind, wonderful daughter? Happy birthday! 45. I don’t need cars, money, fancy clothes… I just need you, my lovely daughter. You’re better than all the riches in the world. Love you so much. Happy birthday! 46. I never thought I’d experience such happiness, but then you were born and I was proven wrong. You bring us so much joy and fun, and I can’t thank you enough for making us so happy. Happy birthday! 47. I hope this day brings you laughter and love. Please, enjoy it, you deserve it so much on this great day. Happy birthday! 48. You’re still growing up, but so far you’ve managed to prove you’re a kind and smart girl. You’ll continued to prove this as the birthdays come and go. Happy birthday! 49. You are so precious to me. Daughter, you bring me strength. You bring me happiness. But most of all, you bring my love. Happy birthday! 50. Life is hard sometimes, but that doesn’t mean you can’t come to me if you need a helping hand. I’m always here for you, no matter what, no matter how grown up you think you are. Happy birthday! You will always be my little princess, and I will always have your back! Happy birthday from dad! Don’t take life’s chances for granted and always have a smile on your face! I am the proudest dad in the world! Happy birthday, kiddo! Hey kid, you are the sunshine in my life and I hope you always remember that! Happy birthday, birdie, love you! I hope I am the dad of your dreams, as you are my dream girl! Happy birthday, little one, and all the best! On your birthday, let me tell you that growing up is so much fun! Hope you have the best life ever! You are now old enough to set up your own tent! Just kidding, baby girl, I’ll always be there to help you out! Happy birthday to you, I am the luckiest dad alive! Your mother and I believe we raised a young woman who is ready to conquer the world! Happy birthday, and may you grow with each year that comes! Happy birthday to my favorite girl, who reminds me of myself every day! Stop growing so fast, I hate it! Love you to the moon and back! I cannot imagine my life without you. You are my greatest purpose and my biggest achievement! I love you, girlie! Your dad. You can give the best love, and you can make me so angry at times! Regardless of it all, I will love you forever and wouldn’t change a day in my life! 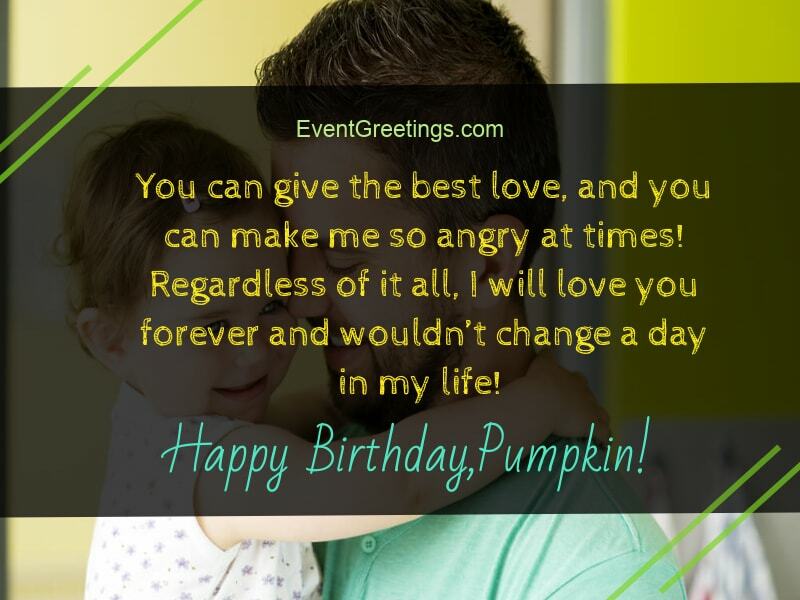 Happy birthday, pumpkin! You may be 8 or 80, and I will still tell you that I love you every single day! Thanks for making me the happiest dad ever! Happy birthday, kid! I had many sleepless nights because of your lively temper, and I wouldn’t have it any other way! Happy birthday, my girl, may you grow as beautiful as me! (lol). I will never have a better football partner or the cutest hug giver than you, my darling girl! Happiest of birthdays, enjoy your day! By now, I believe I taught you how to fish, grill and dig up a yard hole. Hey, those things matter! Happy birthday, lovely girl! Love, your ever-annoying, and loving dad!